Allowed Amount ~ Maximum amount on which payment is based for covered health care services. This may be called “eligible expense,: :payment allowance” or “negotiated rate.” If the provider charges more than the allowed amount, you may have to pay the difference (See also Balance Billing). Balance Billing ~ When the provider bills you for the difference between the provider’s charge and the allowed amount. For example, if the provider’s charge os $100 and the allowed amount is $70, the provider may bill you for the remaining $30. 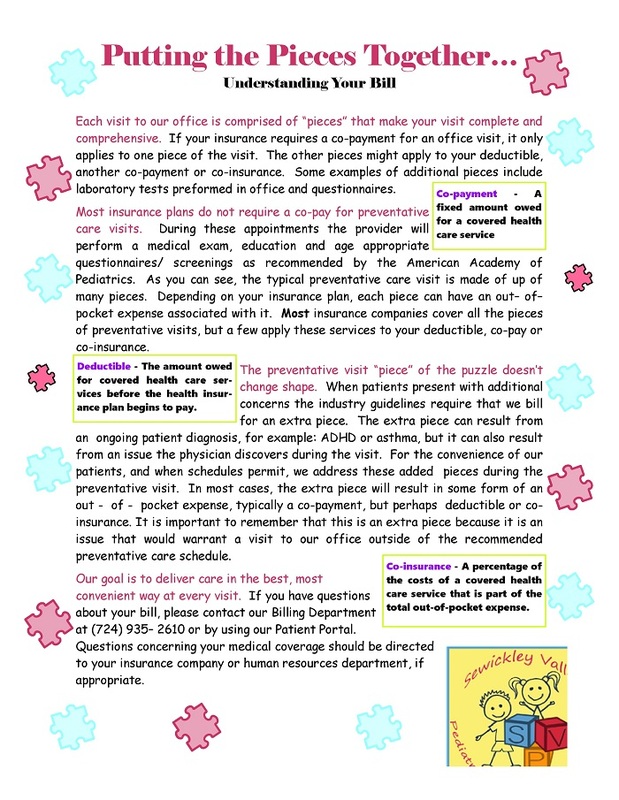 A “preferred provider” may not balance bill you for covered services. Co-Insurance ~ Your share of the costs of a covered health care service, calculated as a percent (for example, 20%) of the allowed amount for the service. You pay co-insurance plus any deductibles you owe. For example, if the health insurance or plan’s allowed amount for an office visit is $100 and you’ve met your deductible, your co-insurance payment of 20% would be $20. The health insurance or plan pays the rest of the allowed amount. Co-payment ~ A fixed amount you pay for a covered health care service, usually when you receive the service. Deductible ~ The amount you owe for health care services your health insurance or plan covers before your health insurance or plan begins to pay. For example, if your deductible is $1000, your plan won’t pay anything until you’ve met your $1000 deductible for covered health care services subject to the deductible. The deductible may not apply to all services. Preferred Provider ~ A provider who has a contract with your health insurer or plan to provide services to you at a discount. Check your policy to see if you can see all preferred providers or if your health insurance or plan has a “tiered” network and you must pay extra to see some providers. Your health insurance plan may have preferred providers who are also “participating providers.” Participating providers also contract with your health insurer or plan, but the discount may not be as great and you may have to pay more.